Paladins are front-line protectors, defenders and stalwarts against the dangerous creatures in the world, safeguarding the vulnerable and innocent. 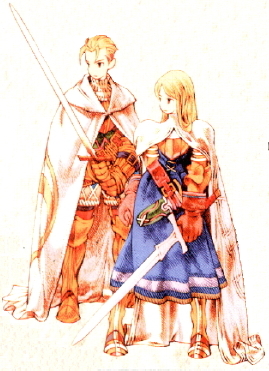 They do this with great stamina, but also with an admirable offense, utilizing potent holy sword techniques, and with healing and enhancing magic, improving their allies' odds of surviving. These are the basic statistics for anybody with Paladin set as their main job. Characters with Paladin as their main job can use the following skills. Vitality: Paladins don't so much explore the wilderness, as blaze a trail through it. Spirit: Paladins convince others by example. Mind: Paladins understand wisdom more than education. Paladins gain the following powers as they gain job levels. 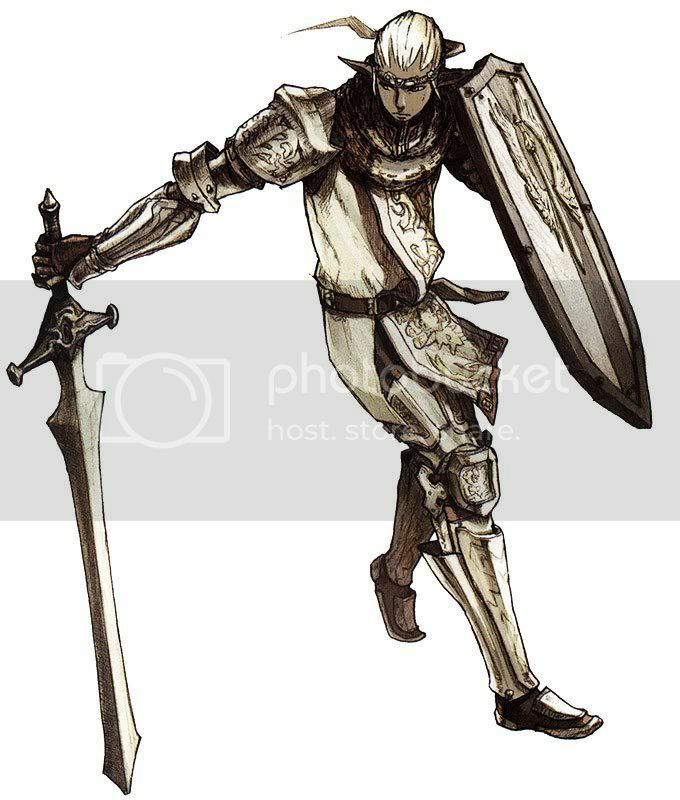 These abilities fall generally into Chivalry abilities, which protect other party members, Crusade abilities, which deal holy damage, and White abilities, which heal and enhance allies. Paladins can defend a charge. Tech 1 A Until your next turn, when the target is attacked, you can make yourself the target instead. Paladins can mend their allies' wounds. 15 MP This Holy effect heals SPELL POWER HP for one ally. Paladins can sow confusion amongst their enemies. 10 MP Deal SPELL POWER Holy damage and roll 1d20. On a roll of 10 or better, the enemy is Confused. Paladins can use holy energy easily. 10 MP The target's attacks deal Holy damage instead of physical damage. Paladins can protect themselves, even as they protect others. Tech 1 A You take no physical damage from the next attack that hits you. Paladins are quite adept at healing the wounded. 25 MP This Holy effect heals SPELL POWER HP for one ally. Paladins can seal their foes wicked spells. 20 MP Deal DOUBLE SPELL POWER Holy damage and roll 1d20. On a roll of 10 or better, the enemy is Silenced. Paladins can attract magic to themselves like a lightning rod. Tech 1 A The next spell that is cast targets you. It has no effect, and you recover MP equal to the spell's cost. 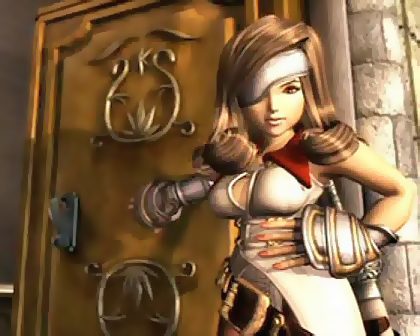 Paladins don't let the white mages heal any better! 35 MP This Holy effect heals TRIPLE SPELL POWER HP for one ally. Paladins demolish their enemies with holy energy. 30 MP Deal TRIPLE SPELL POWER Holy damage and roll 1d20. On a roll of 10 or better, the enemy is killed. Paladins can blast all enemies with holy light. 40 MP Deal TRIPLE SPELL POWER Holy damage to all enemies. Instead of adding your Intelligence to your spell power for this effect, add your Mind. Paladins can customize their abilities with feats, gaining new abilities and options. A paladin with this feat heals all allies with medical knowledge. [Ability] Tech 1 A Heal HALF WEAPON POWER HP for all allies. By taking this feat, a Paladin increases their defensive abilities. [Option] When you use the Defend action, instead of gaining HP, MP, and Speed, you can gain an additional +5 Stamina and Willpower (for a total of +10). A Paladin with this feat covers any ally in crisis, automatically. [Option] When this option is active, you will automatically use Cover on any character that is in Crisis. A Paladin with this feat can convince enemies to flee. [Ability] Tech 1 A Target an enemy in crisis, and roll 1d20. On a roll of 5 or better, the enemy flees on their next turn. A Paladin with this feat can encourage his allies to defend better. [Ability] Tech 1 A Increase an ally's Stamina by your Level until the end of your next turn. A paladin can defend allies from physical attacks with a shield of holy light. 10 MP Bestows Protect on one ally. A paladin can protect allies from magic assault with a veil of holy light. 10 MP Bestows Shell on one ally. A paladin with this feat learns to empower their allies' physical attacks. 10 MP Bestows Bravery on one ally. A paladin with this feat learns to empower their allies's magical attacks. 10 MP Bestows Faith on one ally. Paladins can doom their foes with holy might. 20 MP Deals DOUBLE SPELL POWER holy damage and roll 1d20. On a roll of 10 or better, the enemy is also doomed. Esuna removes one status effect from an ally. 15 MP One status ailment is removed. Raise revives KO'd party members, but leaves them weak. 20 MP This Holy effect revives one KO'd party member, with ONE-QUARTER MAXIMUM HP HP. A paladin can heal all allies with this spell. 20 MP Heals SPELL POWER HP for all allies as a Holy effect. Paladins with special training learn how to use holy magic earlier. 30 MP Deals DOUBLE SPELL POWER Holy damage to all enemies. Paladins may learn specially how to destroy undead. 30 MP Kills one undead creature. Paladins with this feat halt offenders in stasis. 30 MP Deals TRIPLE SPELL POWER Holy damage and roll 1d20. On a roll of 10 or better, the enemy is stopped. Esunara removes all of an ally's ailments. 25 MP All status ailments afflicting the party member are removed. Arise brings an ally back from the brink of death, hale and healthy. 30 MP This Holy effect revives one KO'd party member, with HALF MAXIMUM HP HP. Reraise ensures that an ally who is KO'd will come back. 40 MP When the target party member is KO'd, they instantly are revived with ONE-QUARTER MAXIMUM HP HP. Esunaga removes all ailments and prevents future ailments..
35 MP All status ailments afflicting the party member are removed. The next ailment they are exposed to is also removed instantly.